Someone special in your life who is amazing in creating beautiful artifacts on papers. They can tinker and play with anything everything tactile. You always ask her "how did you do this???" Yep. The person in your life! This will look great in her office or on an analogue table at home. It's a statement piece that says, "I love creating:)". A great collection of MIDORI spiral notebook that can bring creative fuel to your special someone. Bee notebook will be perfect gift for your friend who is looking for ways to capture her memories from the recent road trip she took. Your sister is planning a baby shower for her best friend? Kangaroo Notebook can collect all the inspiration! For a friend who has an amazing collection of stamps. Limited edition, a travel inspired illustration! She has a meticulous handwriting? Her dinner party always comes with name tags AND you pin the little name tag on your inspiration board immediately after coming back from the dinner party? 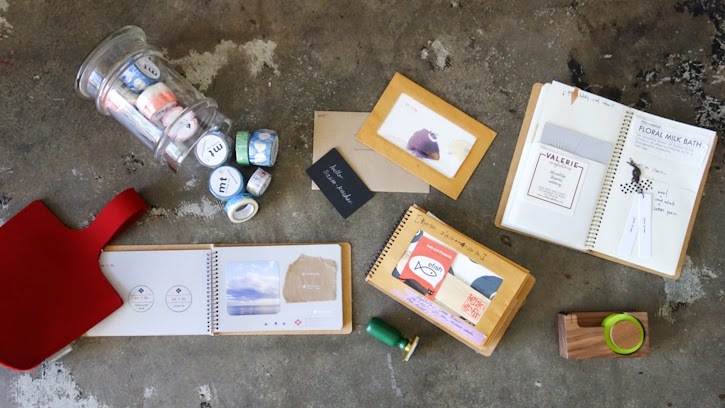 Does your friend takes her analogue materials and tools from one room to another in her house? This little tote can hold the project base tools/materials in one place so she can start working on what she loves as soon as she finds her next inspiring spot whether it's at a living room couch, on a dining table or on her bed! Need a slightly more spacious option? Check out Aika Knitting Bag!